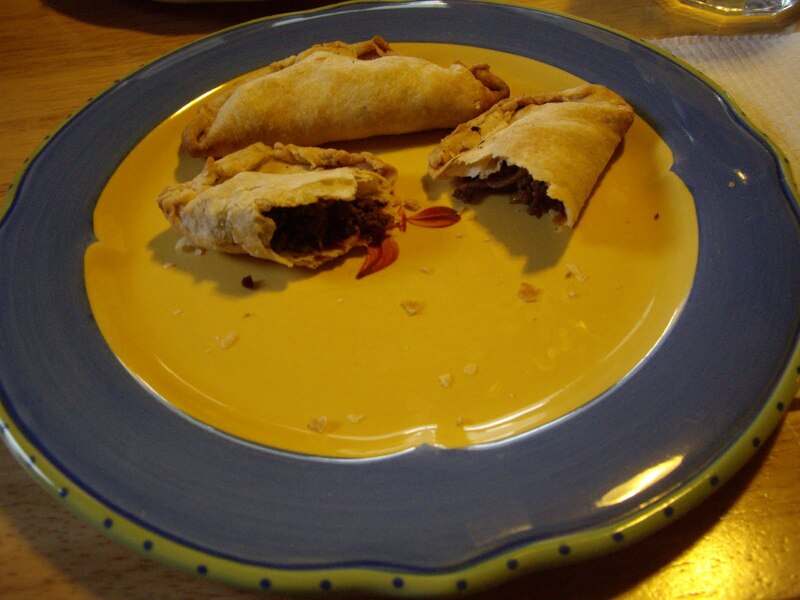 Empanadas are like baby meat pies. 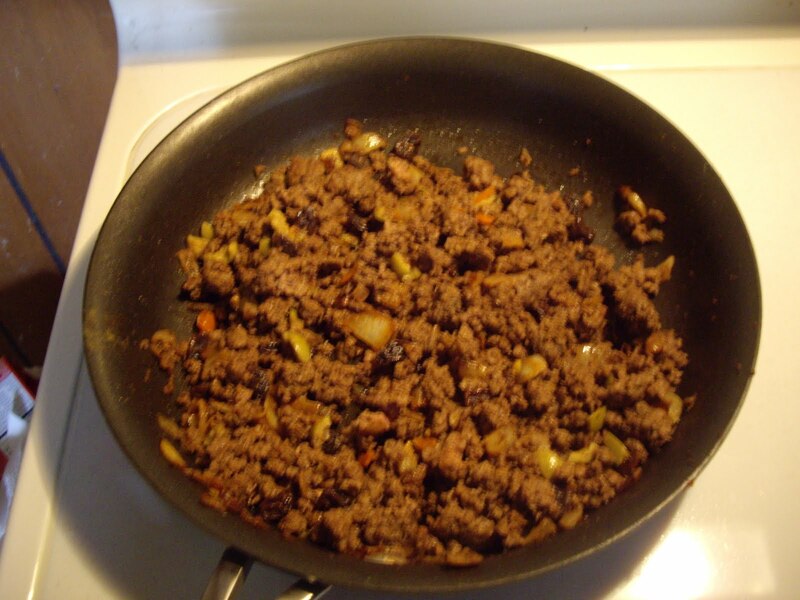 The meat is ground beef that has been seasoned. 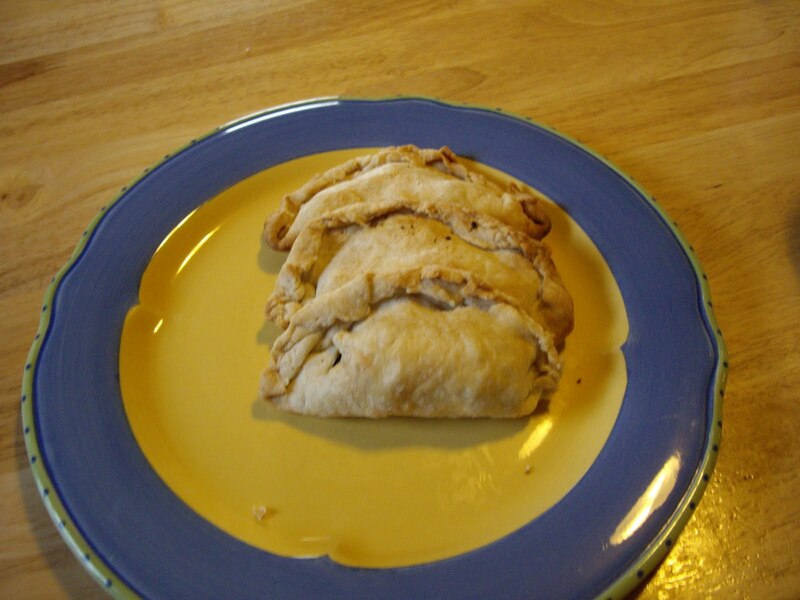 This recipe, I got from “The Pie and Pastry Bible” written by Rose Bevy Beranbaum. I just use a simple pie crust but the rest is essentially hers. The raisins and olives are optional but highly recommended. Make the pie crust and divide it into 12 equal pieces. Cover with towel and refrigerate until ready to use. Soak the raisins in the water for 20 minutes. Drain and set aside. Chop olives. Add to raisins. Put a skillet over medium heat and add the oil. Add the onions and sugar. Stir occasionally until they turn golden- about 10 minutes. Add the garlic and sprinkle with the paprika and cumin. Stir and cook for 2 minutes to bring out the flavor of the spices. Add the meat, salt, pepper, chile powder, thyme, and oregano. Cook until meat is browned all over. Remove from heat and stir in the olives and rains. Set aside and let the meat cool thoroughly before making the empanads. One by one, roll each piece of dough into about a 6″ circle. Just shape it the best you can. Add 3 Tablespoons meat filling to the rolled out dough. Bring the bottom edge up over the meat and seal closed. Just fold it over and press with your fingers. Repeat with all the dough and meat. Stick the empanadas in the fridge until the oven is ready. Bake for 20-25 minutes or until the pies are golden.